If you asked Tatyana Crowder what her future plans were right now, you might not get a lot of details about the specific place or exact job she will pursue. Instead, she might fill you in on some of her personal goals, like playing the guitar more frequently, becoming fluent in Spanish or learning jiujitsu. For Crowder, her circumstances have not always been ideal, and the future has not always been clear, but her focus on her perspective and her mindset of gratefulness are what have helped her overcome. PATIENCE — Crowder was originally a walkon for the Lady Flames. 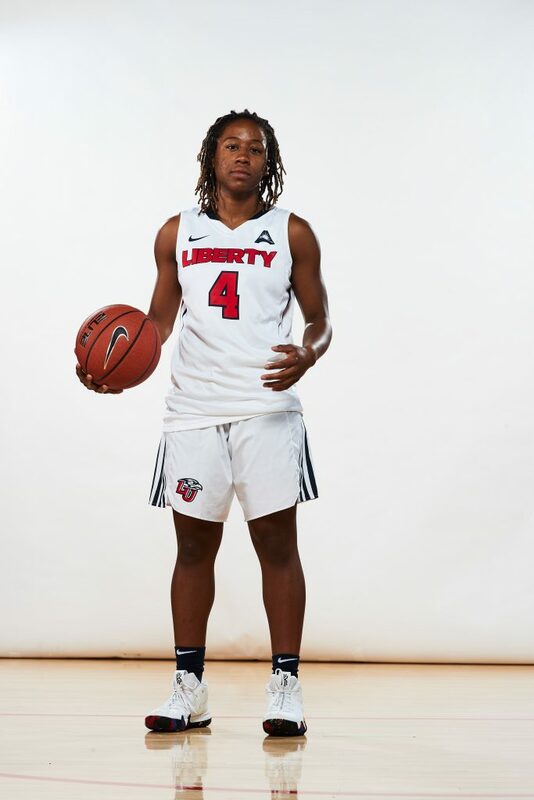 Crowder, a senior captain on the Liberty women’s basketball team, had to overcome a lot of obstacles, but those difficulties have shaped her perspective along the way. Crowder is the youngest of five children and grew up with a single mother in an urban neighborhood in Roanoke, Virginia. She struggled with behavioral issues as a child, but the trials she endured at a young age have translated into an encouraging testimony. Basketball did not become a major aspect of Crowder’s life until seventh grade. Before middle school, her mom would not allow Crowder to play organized basketball, so she instead learned the game by watching her older brother play. Once she began playing, Crowder was a standout high school player at Parkway Christian Academy in Roanoke, before transferring to Liberty Christian Academy her junior year. The star guard would be selected to the Lynchburg News & Advance all-area first team in her senior year, as well as earning second team VISAA all-state honors in both years at LCA. Despite her excellence on the basketball court, the 5-foot-6 Crowder received only NAIA and Division II scholarship offers, but she had her sights set on attending Liberty. While playing at LCA, the Liberty coaching staff knew about Crowder’s talent, consequently they watched and evaluated her as a player during high school. Coach Green admitted he truly wanted Crowder to be a part of his program, but he simply did not have a scholarship to offer her at that time. Crowder decided she would come to Liberty as a regular student, even if it meant giving up basketball. Then, just two weeks after making the decision, she was invited to be a part of the summer bridge program and become a walk-on for the basketball team. Walking on, maintaining grades and working to pay for school was not easy, but Crowder was thankful to just be a part of the team. Crowder would play just 30 minutes and score two points in her freshman year, but the tenacity and energy that she brought to the team was evident, even when she was not on the court. One of the special moments of Crowder’s time at Liberty came in the summer following her freshman season. On the day before she was set to leave for a summer internship, Coach Green sat her down in his office and offered her a scholarship. Crowder worked hard and became a team captain in her sophomore season, appearing in 27 games. In her junior season, Crowder made 33 appearances, including the first 17 starts of her career. As Crowder continued to see more playing time, the team kept winning. The success culminated in 2018, when the Lady Flames won the Big South Championship and ventured to play in the NCAA Tournament. Crowder graduated in May 2018 with her bachelor’s degree in social work, after just three years at Liberty. She is in the process of completing her master’s in public health, as she is using her final year of eligibility for the Lady Flames. The Lady Flames got off to a tough start in the 2018-19 season, but the team has now won their past four games in a row, thanks in large part to the charismatic leadership of Crowder. For as successful as the teams Crowder has been a part of, she understands that the impact she has the chance to make with her teammates goes far beyond basketball. Crowder continued to emphasize the importance of how her perspective and legacy transcends the championships and anything she does on the court. As her time winds down at Liberty, Crowder is just enjoying the fleeting moments of what has been an inspirational story and a fruitful career with the Lady Flames.